Gato Class Submarine: Laid down, 30 October 1942, at the Electric Boat Co., Groton, CT.; Launched, 11 July 1943; Commissioned USS Flier (SS-250), 18 October 1943; Sunk, 13 August 1944 by a mine in Balabac Strait; Struck from the Naval Register, (date unknown). Flier received 1 battle star for World War II service. 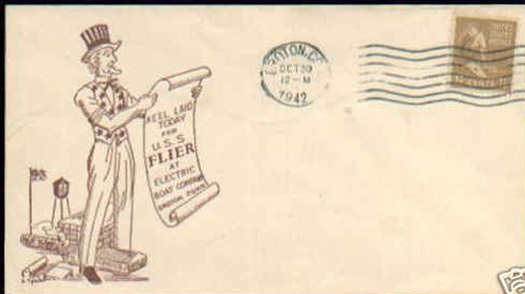 16k Commemorative post mark on the occasion of the keel laying of the Flier (SS-250) at Electric Boat, Groton, CT., 30 October 1942. Courtesy of Jack Treutle (of blessed memory). 63k Commemorative post mark on the occasion of the keel laying of the Flier (SS-250) at Electric Boat, Groton, CT., 30 October 1942. Courtesy of Jack Treutle (of blessed memory). 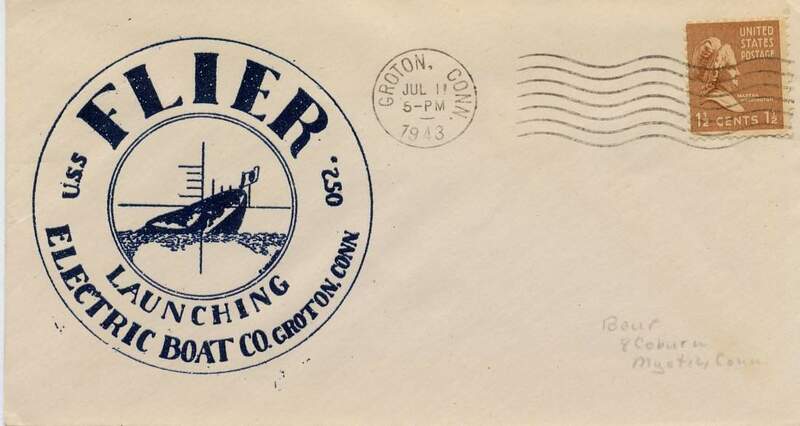 60k Commemorative post mark on the occasion of the launching of the Flier (SS-250), 11 July 1943. Courtesy of Darryl L. Baker. 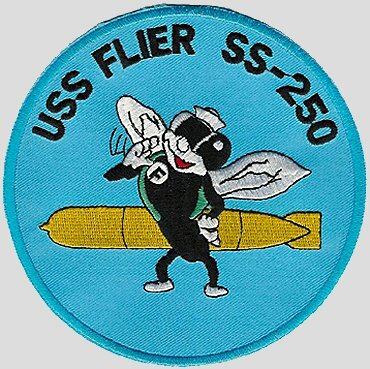 1.26k Flier (SS-250) reached Pearl Harbor from New London 20 December 1943, and prepared for her first war patrol, sailing 12 January 1944. Damage suffered in a grounding near Midway necessitated her return to the west coast for repairs. 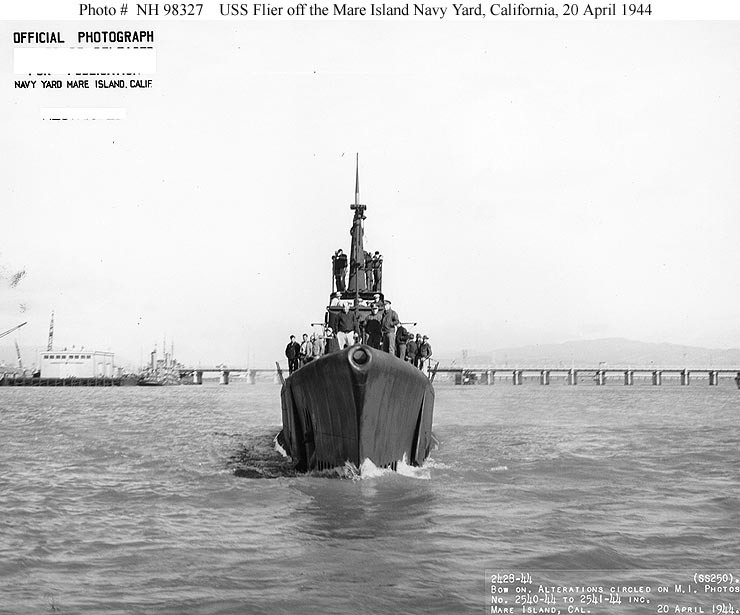 She is pictured here off the Mare Island Navy Yard, California, 20 April 1944. Partial text courtesy of DANFS. Official USN photo # 19-N-65326, courtesy of Scott Koen & ussnewyork.com. 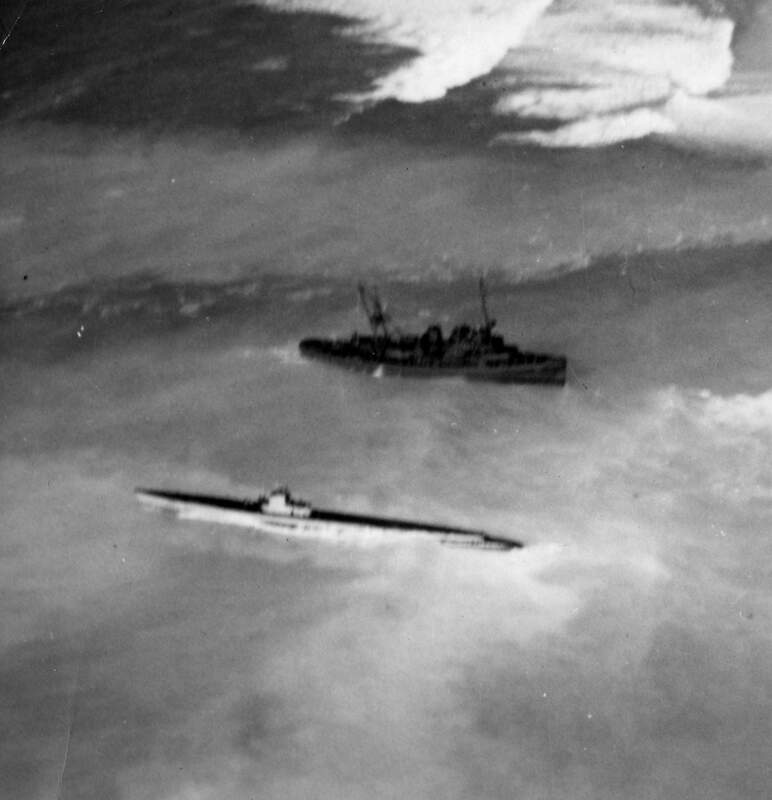 1.41k Flier (SS-250) and Macaw (ASR-11) aground at Midway, 17 January 1944. The view is from ENE. The outflow from the channel into the lagoon is visible as a whitish band beyond the Macaw. Note that the vessels are pointing in opposite directions—the Macaw north, in toward the lagoon, the Flier south and out to sea. Photo & text courtesy of ussmacaw.org via Robert Hurst. 135k Macaw (ASR-11), in foreground, and Flier (SS-250) aground at Midway, 16 January 1944. 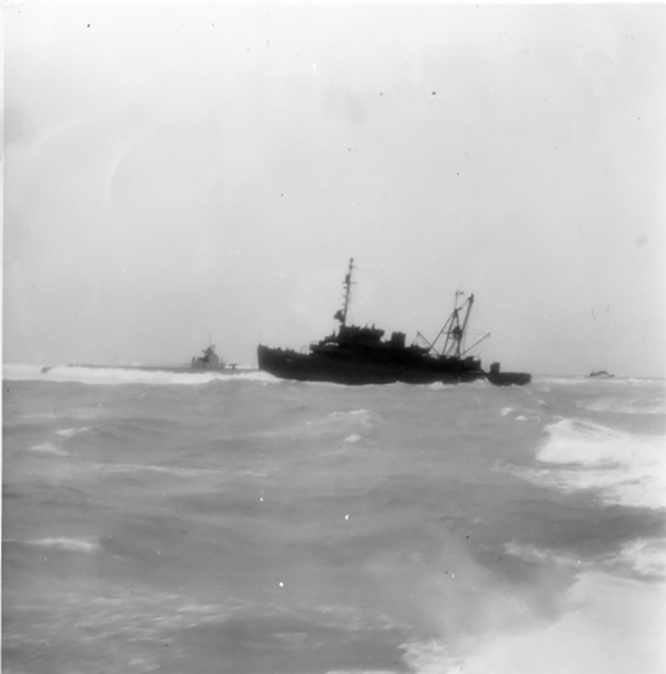 Vessel in background at right is unidentified. Photo & text courtesy of ussmacaw.org via Robert Hurst. 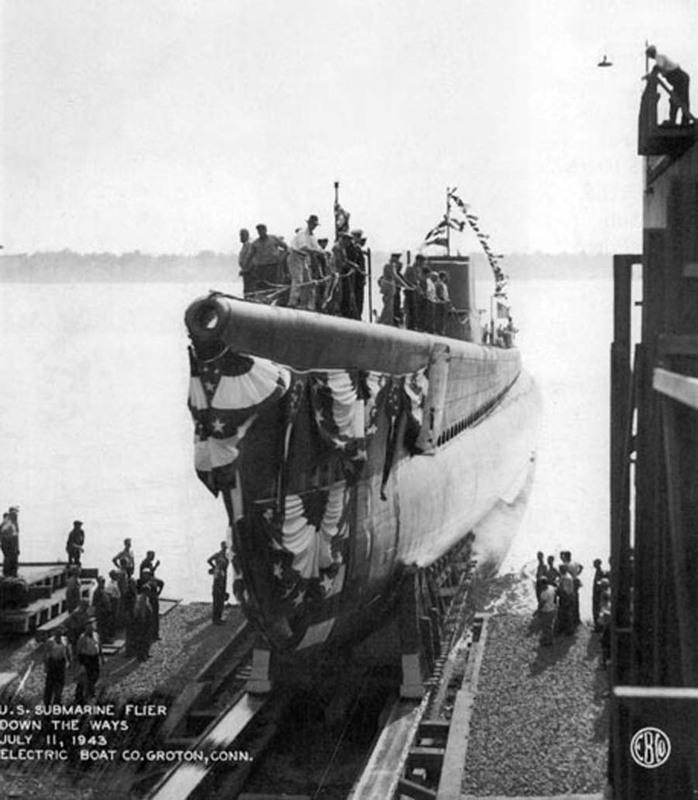 225k Flier (SS-250) off the Mare Island Navy Yard, California, 20 April 1944. 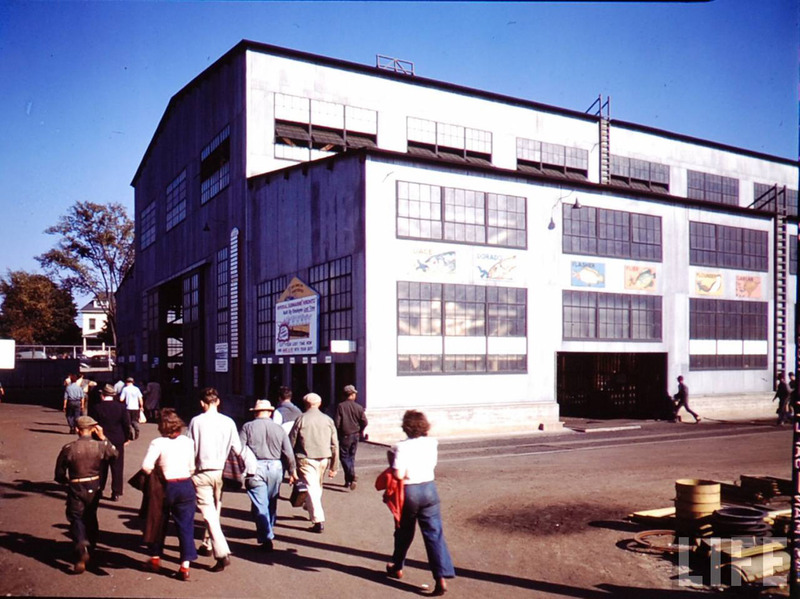 Mare Island photo # 2429-44, courtesy of San Francisco Archives, Mare Island Navy Yard Ship Files via Tracy White @ researcheratlarge.com. 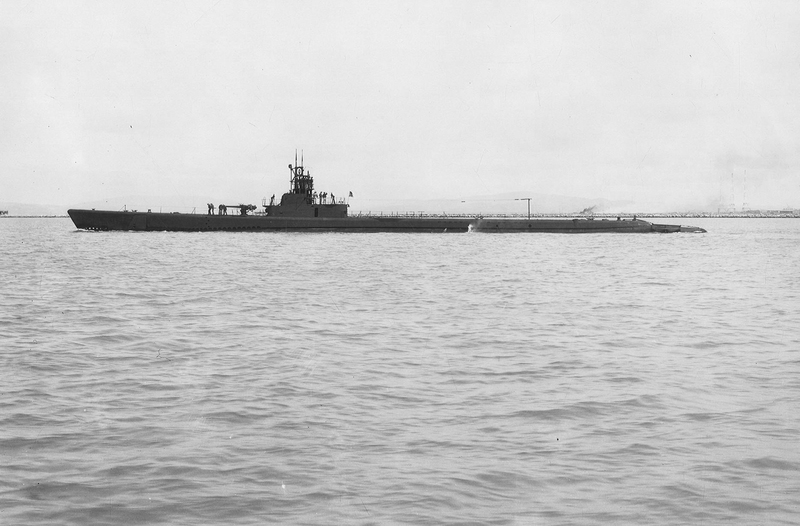 76k Flier (SS-250) off the Mare Island Navy Yard, California, 20 April 1944. Note the temporary propeller guards attached by chains to her after hull. Official USN photo # NH 98326, from the collections of the US Naval Historical Center. 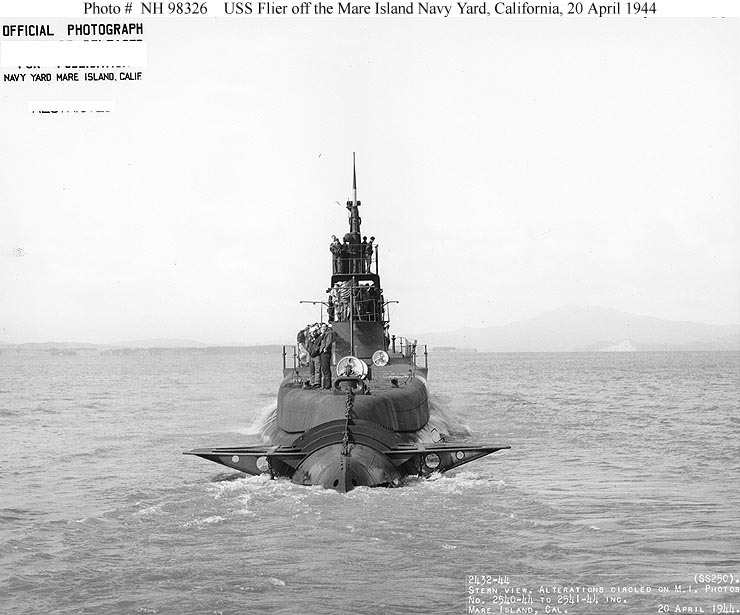 68k View of the Flier (SS-250) from directly ahead, taken off the Mare Island Navy Yard, California, 20 April 1944. Official USN photo # NH 98327 from the collections of the US Naval Historical Center. 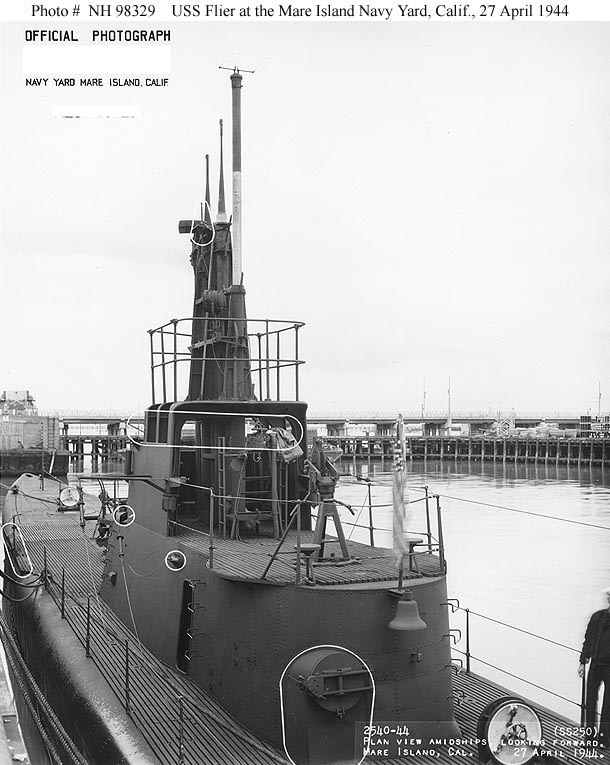 109k Plan view of the Flier (SS-250), amidships, looking aft, taken at the Mare Island Navy Yard, California, 27 April 1944. Note the submarine's 4"/50 deck gun in lower left and mounting for a 20mm gun on the platform in center. Circles mark recent alterations. Barges in the right distance include YC-312 (with dark hull, outboard), and YF-509 (inboard and closer to the camera). Official USN photo # NH 98328, from the collections of the US Naval Historical Center. 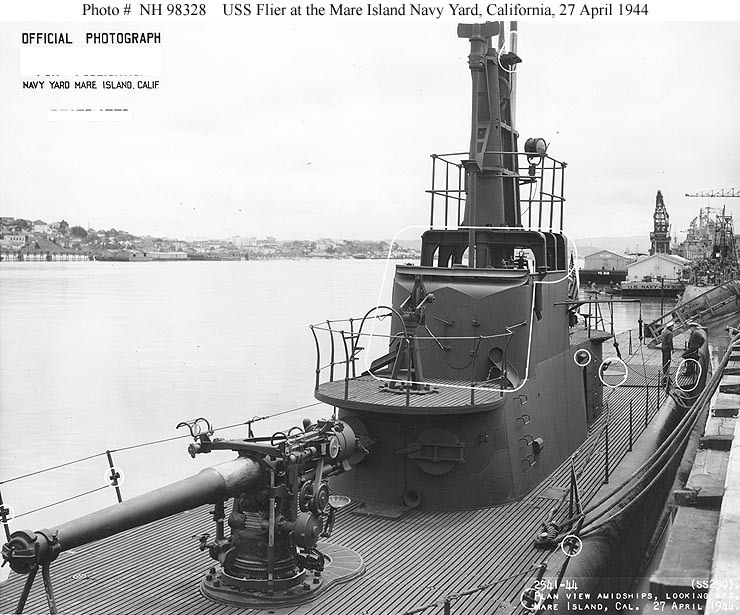 91k Plan view of the Flier (SS-250), amidships, looking forward, taken at the Mare Island Navy Yard, California, 27 April 1944. Note the submarine's bell in the lower right center, with a mounting for a 20mm gun on the platform above and a pressure-tight ready service ammunition locker below.Circles mark recent alterations. Official USN photo # NH 98329, from the collections of the US Naval Historical Center. 130k 317 miles WSW of Iwo-Jima on 4 June 1944 at 0405, SS Hakusan Maru is attacked by LtCdr John D. Crowley’s Flier (SS-250) and hit port side by two of three torpedoes torpedoes fired. 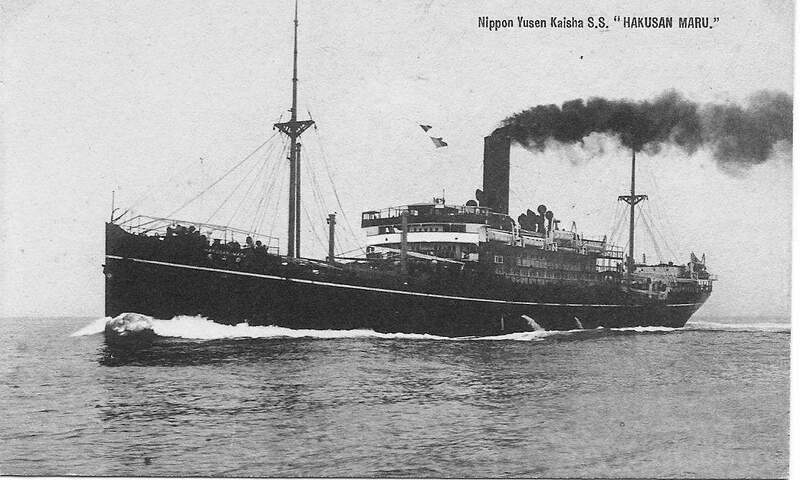 At 0415, SS Hakusan Maru's stern rises vertically and she sinks at 22-37N 136-50E. The escorts counter-attack and drop thirty-four depth-charges, but without damage to Flier. Text courtesy of combinedfleet.com. 441k On 26 July '44, Lt.Cdr. Manning M. Kimmel's Robalo (SS-273) is sunk W of Palawan Island in the Balabac Strait. Robalo may have hit a mine laid by Tsugaru in March '44. On 13 August '44, Lt.Cdr. John D. Crowley's Flier (SS-250) also hit a mine S of Palawan in the Balabac Strait that may have been laid by Tsugaru; however, some mines were also laid in the Balabac Strait in 1943. Photo & text courtesy of combinedfleet.com. 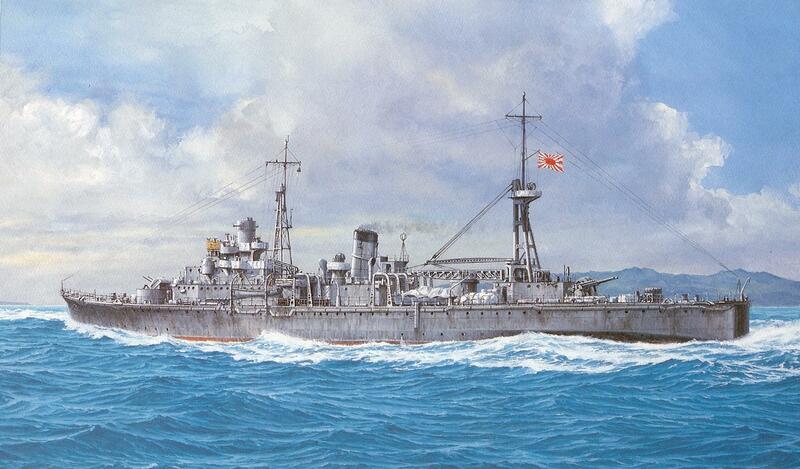 Photo by Takeshi Yuki scanned from "Color Paintings of Japanese Warships". 105k Survivors of the sinking of the Flier (SS-250) gather on the deck of the Redfin (SS-272) shortly after their rescue in 1944. From left in the first row are James Russo, Wesley Miller, Earl Baumgart and Arthur G. Howell. 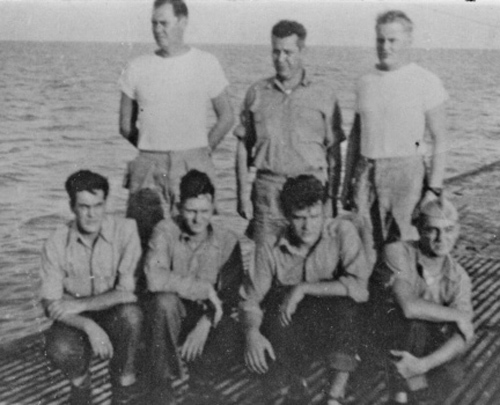 From left in the back row are Lt. Jim Liddell, Capt. John Crowley and Ensign Alvin Jacobson. Don Tremaine was in sickbay at the time the picture was taken. Photo courtesy of Nelson and Lana Jacobson via mlive.com & thesubreport.com. 91k A Painting of LeRoy, J. MOMM1 K.I.A. with the Flier (SS-250), by his sister, Margorie LeRoy Riikola. Courtesy of csp.navy.mil/ww2boats/flier.htm. 92k Clyde Banks (left) and an unidentified friend. Geraldine Green was just a little girl in the spring of 1944, but her memory of the last time she saw her cousin Clyde Banks is crystal clear. 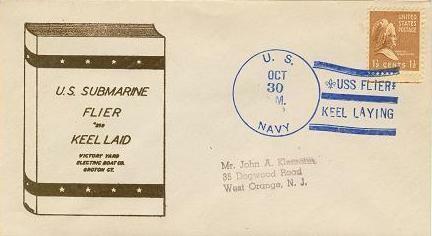 Clyde was a sailor, home on leave from duty on board a submarine, the Flier (SS-250). When his leave came to an end, 6-year-old Geraldine walked with her cousin, her grandmother, and her aunt Myrtle - Clyde's mother - the short distance from their home on Baymiller Street to Union Terminal, a place teeming in those days with young servicemen saying goodbye and being welcomed home. She remembers looking up at her cousin in his crisp, blue uniform, looking more grown-up than she had ever seen him, no longer the boy she had seen every day walking to Bloom Junior High School. She remembers her aunt Myrtle, at the station, holding on to her youngest child, hugging and kissing him "She would not let go,'' said Mrs. Green, who lives now in Mount Auburn. "I remember they practically had to pull her off of him. Maybe, in her heart, she knew." What Myrtle may have known in her heart was that she would never see her boy again. 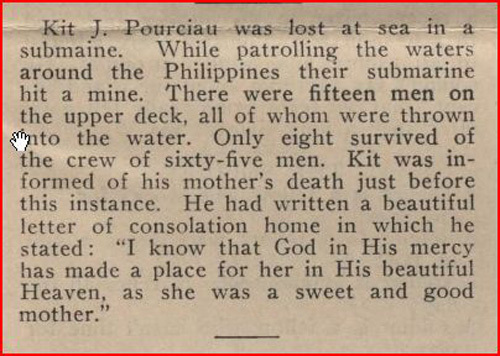 Three months later, in August 1944, the young steward's mate - the ship's cook - died at sea when the Flier sank to the ocean floor in the Balabac Strait, between the Philippine Island and Indonesia. Myrtle passed away long ago, as did Clyde's father, Samuel Banks. But dozens of family members are still living, here and elsewhere. Next month, with the near-miraculous discovery of the Flier last year and a nationwide effort to find surviving family members, many of Clyde Banks' relatives will be traveling to Muskegon, Mich., next month for a reunion of the families of Flier sailors and, at long last, a memorial service to honor their sacrifice. Banks and the other first cousins were just children when Clyde was lost at sea, but they all have memories of him. Clyde was not married; he had lied about his age three years earlier to get into the Navy. Some family members say he was 16 at the time; others say he was probably 17. Either way, he was just beyond boyhood when his life ended. The photograph that Ted Banks has kept all of these years, of Clyde Banks as a young sailor, looking more boy than man, is how most of the many cousins who grew up with him in the West End remember the boy they called "Bay-Bay." No one is quite sure how the youngest son of Samuel and Myrtle Banks got that nickname; perhaps it was the baby-face that shines off the photo Ted Banks has kept all these years. The cousins are all now in their senior years; their faces are not frozen in time the way their cousin's is. But they remember. They remember the news that came in the summer of 1944, when dozens of family members gathered at Clyde's grandfather's house on Court Street. There was no body to mourn over, no grave to dig. Just tears and heartbreak at losing one of their own. "It was a sad, sad time,'' Ted Banks recalled, sitting at the dining room table in his Evanston home this week, looking at old family photographs with two more of Clyde's first cousins, John Smith, the mayor of Silverton, and Warren Brooks of Bond Hill. "He was lost forever; and we had no body to bury,'' Banks said, shaking his head at the memory. "Just deep sadness." Green remembered her Aunt Myrtle being devastated by the loss - she had one other child - Samuel Jr., known as Snoopy, serving in the Army - and she was afraid of losing him as well. Samuel Jr. came home, but died in 1954 during heart surgery at Walter Reed Army Medical Center. Today, there is still no body for the Clyde Banks' family to bury, but there is some joy, some relief, and some sense of closure, in knowing now what happened to the cousin whom they lost so many years ago. In the spring of 2009, a father-and-son team of deep-sea divers, Mike and Warren Fletcher, the stars of a Canadian television show called "Dive Detectives," dove into the waters of Balabac Straight with a Canadian film crew and found the wreckage of a submarine. The U.S. Navy was alerted, and confirmed earlier this year that the wreckage, lying 330 feet below the surface of Balabac Strait, was indeed the Flier. 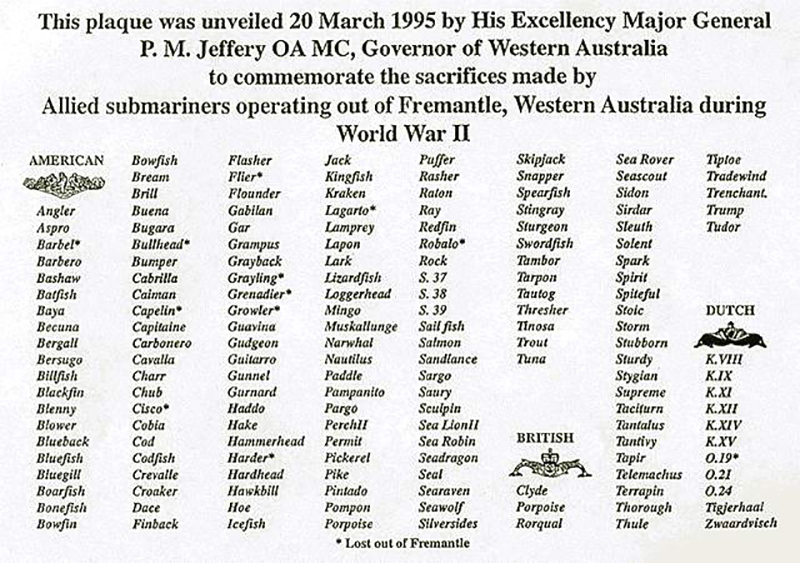 In all, 59 sailors lost their lives. Fourteen had managed to escape the sinking sub, which had struck a mine while passing through the strait on the surface, heading for the South China Sea. Only eight of them managed to get to shore and were rescued. 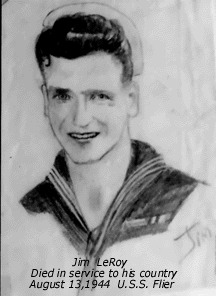 One of them, Al Jacobson of Muskegon, Mich., spent the rest of his life searching for his lost shipmates. Jacobson died two years ago, but his family took up the cause; and it was the Jacobsons who steered the film company in the direction of the Balabac Strait, where they made their remarkable discovery. Once the Navy confirmed that the wreckage was indeed the Flier, efforts began to locate surviving family members of the men who went down with the Flier. 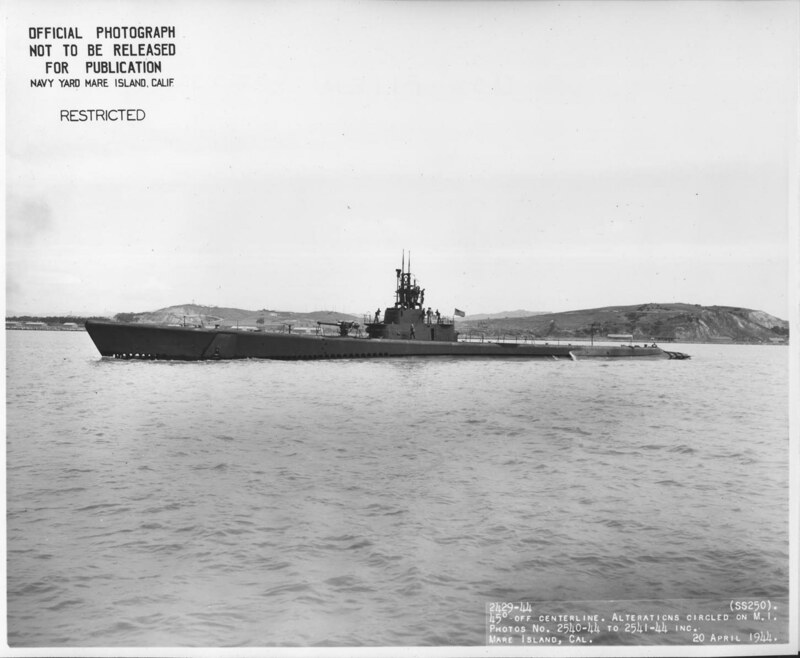 The Navy was aided by Charles Hinman of the Bowfin Museum in Honolulu, who started a web site dedicated to the Flier and efforts to find the crew, and Mary Bentz, a Bethesda, Md., woman who had tracked down dozens of surviving family members of the USS Grunion, a submarine that had gone down in July 1942, taking the life of her uncle. The Navy issued press releases about the discovery and efforts to find the families. Information was printed in February in the Cincinnati Herald, an African-American newspaper which Ted Banks reads religiously. He saw the notice, contacted the Herald; and was put in touch with Bentz. "We were just overjoyed to hear from the Banks family,'' Bentz said. "We were getting nowhere. They were one of the last to be located." It is ironic that Clyde Banks' descendants were so hard to find, given that there are so many of them. Clyde's grandfather, Alexander Banks, had 23 children from two wives, including Clyde's father, Samuel. His mother, Myrtle, came from a large West End family as well. There are at least six first cousins living in Cincinnati; and many more spread out around the country. "It's a big, big family,'' said Brooks, who is from Banks' family. "We have family in Texas, in Florida, all over. On both sides of the family." Now, many of them - perhaps as many as two dozen - will be loading up in rented vans next month and making a 300-mile trip to Muskegon, Mich., for a three-day reunion of the Flier families, hosted by the Jacobson family. 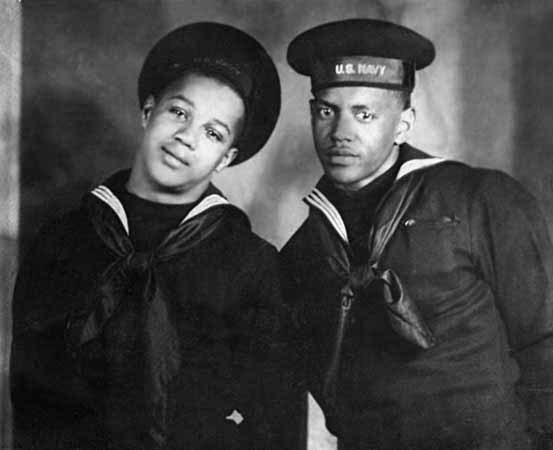 On August 13 - the 66th anniversary of the sinking of the Flier - Clyde Banks' relatives and the other families will participate in a memorial service for the lost sailors. "It's the closest thing to a funeral Clyde will ever have,'' Ted Banks said. Sandra Johnson of Madisonville is one of the first cousins who will make the journey to Muskegon, along with her daughter, Tracy Gibson, a 13-year-old grandson and a five-year-old granddaughter. "I doubt if the little one will understand it all, but the 13-year-old will,' Johnson said. "I want them to know about Clyde. I want them to know what sacrifice their family made, all those years ago." Text courtesy of news.cincinnati.com via Ed Pietzuch, USN 1967-1971. 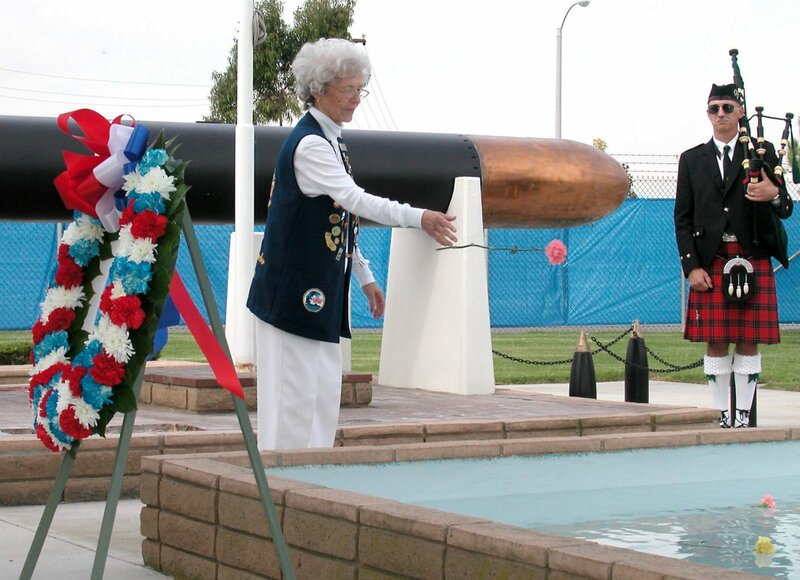 Photo courtesy of Bowfin Submarine Museum & Park, & On Eternal Patrol. 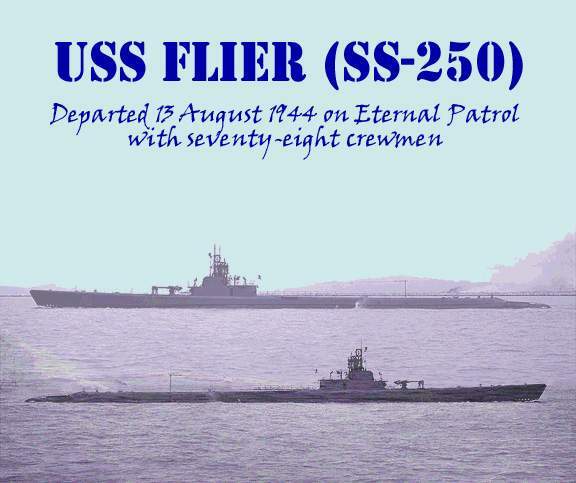 35k Commemorative photo in honor of the memory of the crew of the Flier (SS-250). Photo courtesy of Tom Kermen. Dante's Prayer courtesy of Loreena McKennitt via quinlanroad.com. 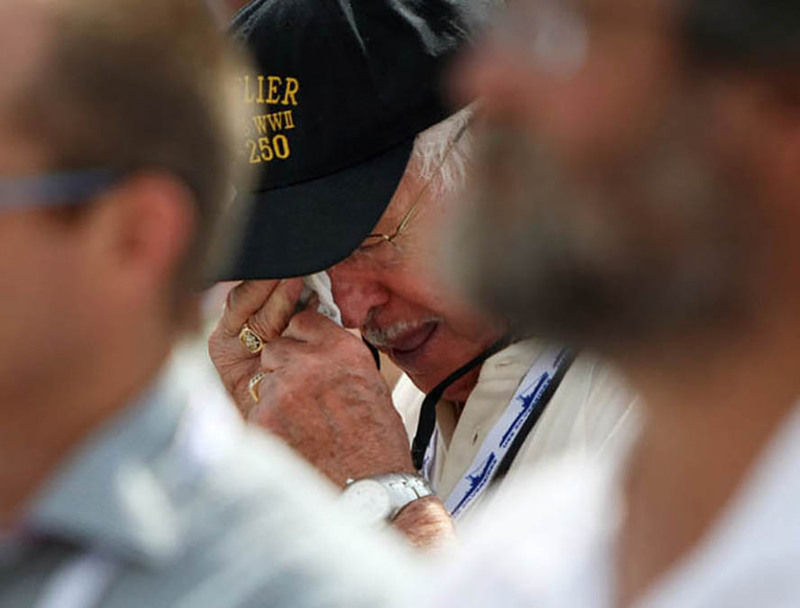 54k Jim Alls, 83, reacts during a family memorial ceremony for the Flier (SS-250) at the Great Lakes Naval Memorial and Museum in Muskegon Friday, August 13, 2010. Alls, who lives in Independence, Ky., was part of the Flier crew, but was left onshore to be hospitalized for getting into a bar fight. Donald Nesser See, who took Alls place, perished on the sub. Alls represented See at the ceremony. Photo courtesy of Cory Morse / The Muskegon Chronicle via On Eternal Patrol. 507k 5 still photo PDF from the video produced by Yap films showing the grave of the Flier (SS-250). "When the waves of death compassed me / the floods of ungodly men made me afraid; / the bonds of She'ol encircled me; / the snares of death took me by surprise; / in my distress I called upon the Lord, / and cried to my G-D: / and he heard my voice out of his temple, / and my cry entered into his ears. / Then the earth shook and trembled; /the foundations of heaven moved / and shook because of his anger /...the heavy mass of waters, and thick clouds of the skies /... And the channels of the sea appeared, / the foundations of the world were laid bare, / at the rebuking of the Lord, at the blast at the breath of his nostrils. / He sent from above, he took me; / he drew me out of many waters; / he delivered me from my strong enemy, and from those who hated me; for they were too strong for me. / They surprised me in the day of my calamity: / but the Lord was my stay / He brought me forth also into a large place: / he delivered me because he delighted in me./" Video FLIERfinal1080 courtesy Charlotte Johns via Ron Reeves (of blessed memory) & Charles Tompkins. 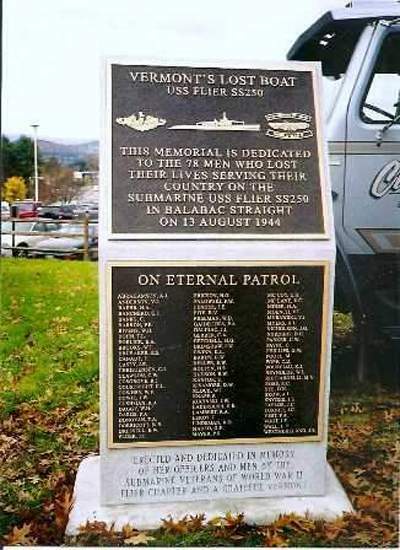 46k The Flier (SS-250) posted at the Veterans Administration Hospital in White River Junction, Vermont. Photo courtesy of Bill Gonyo.